Nat Moss died on March 18, 2017 at Richmond University Medical Center, Staten Island. 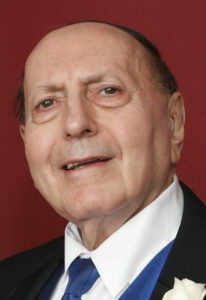 Born in Brooklyn in 1927, He came to Staten Island in 1962. He held a B.A. from Bucknell University, Lewisburg, PA and an Engineering degree from Pratt Institute in Brooklyn, NY. For many years he was a partner with his brother, George in a manufacturing business in Brooklyn doing extensive government contract work. He held several patents for mechanical devices. When he first came to the island he was very active in democratic politics and was the President of the Staten Island Banner Democratic Association and published a small newspaper- The Staten Island Banner. In later years he served as a trustee. He also did volunteer work for the Staten Island Zoological Society. Nat is survived by his former wife of 42 years, Angela, his son Ben, his daughters Bettina, Selma Ward, Grace, Michele Pizzo and Jeanine. His granddaughters, Gianna, Megan and Paige; His grandsons, Patrick, Brendan and Anthony. In lieu of flowers, please donate in the loving memory of Nathan Moss to the Staten Island Zoological Society. Calling hours will be held at Cherubini McInerney Funeral Home in Staten Island on Saturday from 8:30-10:00am. A service will be held on Saturday at 10:00am at Cherubini McInerney Funeral Home followed by a burial at Ocean View Cemetery.